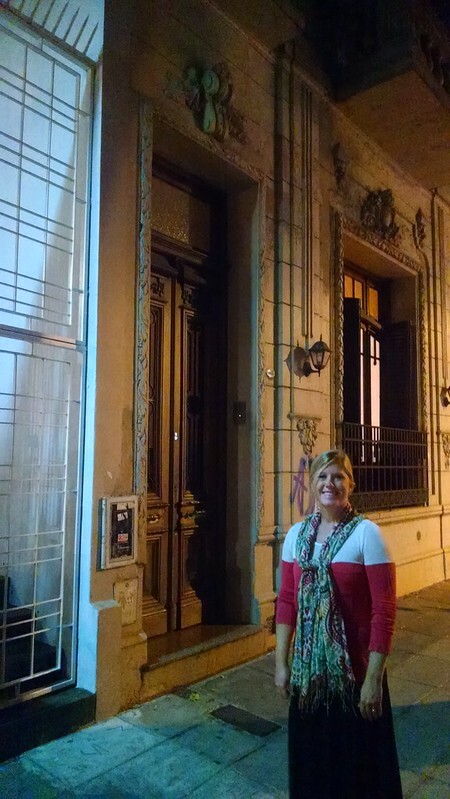 We stumbled across a blog back in October before we left that mentioned Buenos Aires’ reputation for “underground” or “closed-door” restaurants. These are places that would often times be operated out of someone’s house. Perhaps it was member-only or you needed a recommendation from someone who had eaten there or knew the operators. Some you merely needed a reservation and had to pre-pay a deposit. This type of dining scene is tightly regulated in the states, especially in Chicago. Many cities battle with how to govern new food services such as food trucks let alone someone running a 20-seat restaurant out of their living room. The biggest concern in the U.S. from what I could read while doing research was the lack of health and safety oversight for these places and as such they were not legally permitted to operate. Well, here in Buenos Aires they don’t (appear to) have those concerns. A little over a week before we arrived we went back and re-read the blog. I was just as excited as I remember. Most of the places were serving multi-course tasting menus with wine pairings. This was going to be such a pleasant change of pace for us. We were missing a unique dining experience like this. 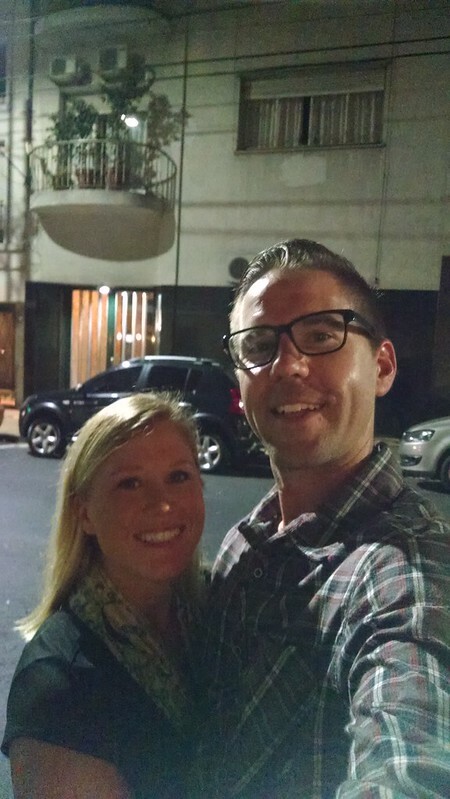 Since we began telling people about our trip to South America we kept hearing things like “oh my god – the steaks in Argentina!” And “the food is really amazing and super cheap.” I hate to admit this, but the food and the prices have been very underwhelming. I think that is part of the blessing and a curse of living in or around a big city like Chicago or New York (or L.A. or San Francisco). It’s awesome because you can get unbelievable food from every corner of the earth anytime you want. But it sort of ruins it for the times (for me at least) when you are spending several weeks or months in foreign countries because really…the food is not much, if any, better. And the variety isn’t even close. For the variety piece let me help put this in perspective. I pulled all these numbers from TripAdvisor – which in all likelihood is more popular in Chicago than in South America so these aren’t precise, but it sure does paint a picture. Chicago has 5.7x (or 7,000 more restaurants) than all of the restaurants in the cities we visited prior to Buenos Aires COMBINED. (The entire Galapagos Island archipelago, Montanita, Cuenca, El Calafate, Bariloche, Montevideo, Punta Del Diablo, Punta Del Este & San Jose). Those cities and islands have a total of 1,487 restaurants (again, on Trip Advisor). Chicago has 8,472. Just FYI New York City has just under 12,000 restaurants. Buenos Aires (BA) has 2,000. So yes, we were excited for a little change of pace. Long story short we were excited for these closed-door, underground places to eat. We made reservations at three different restaurants (in 10 days). Each brought a little something different to the table. 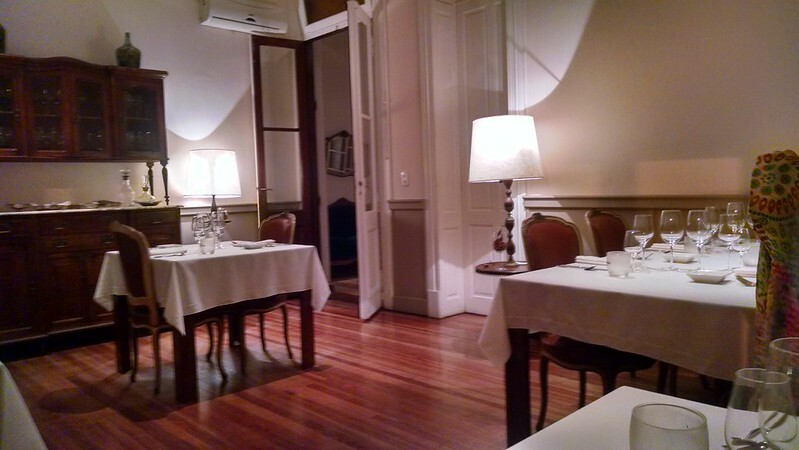 We kicked off our tour of this dining scene on the first night that we arrived in BA. Casa Saltshaker is arguably the most famous and popular of these types of restaurants having been doing it for the longest (10 years). It’s run by an expat from the United States out of his apartment in a very nice part of BA. Casa Saltshaker is unique because everyone sits at one table. Communal dining. And for a couple like Lindsay and I that meant we would be sitting with eight other strangers at the dinner table. If you like a little adventure in the city just finding these places will be fun. We walked to Casa Saltshaker from our place (about a 30 minute walk) for the 9pm reservation. 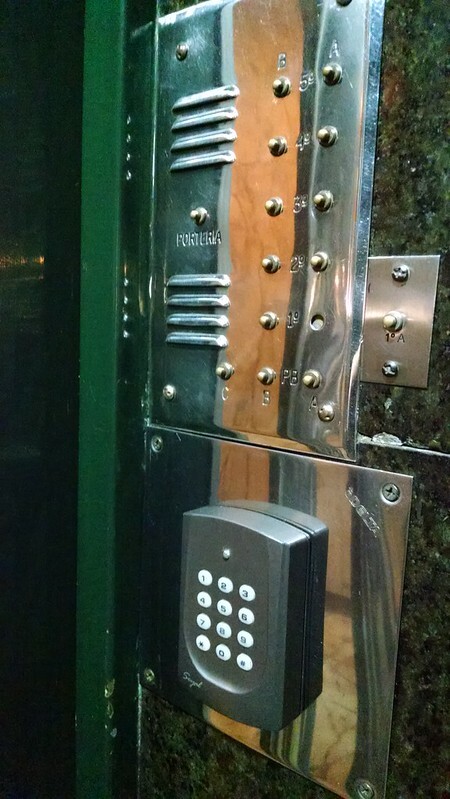 And yep – it is just someone’s apartment. Unmarked. For us we rang the doorbell and hoped that Google Maps took us to the right place – and sure enough it did. Their place is really nice and when you arrive they serve you a welcome cocktail. I can’t recall exactly what it was – but it’s small, more like a “shooter” or a shot than a cocktail. They usher you into the living where you are encouraged to introduce and mingle with the rest of the group. That is Lindsay and I in the foreground. The apartment where Casa Saltshaker is located is in the background. The buzzer you ring. It’s important to pick the right apartment. The folks we would be eating with were all connected in some way, shape or form. Four college-aged kids and four parents/parents’ friends. They were all originally from San Francisco and two of their kids were studying abroad in BA. Luckily the groups was very easy to talk to and get along with. So much so that Lindsay and I didn’t sit next to each at the table. Where all the magic happened at Casa Saltshaker. The table of 10. The Good: How it all worked. The welcome cocktail. The 10-person maximum. The communal dining. It all worked really well and are the exact reasons that I would recommend this place to someone. The food was good and it was different and it was fun. Five total courses with five wine pairings. The people we met and the conversations we had we’re the star. Dinner started at 9:15pm and we walked out around 12:30am. The OK: There were times when we felt the host was a bit frustrated with how much we were talking. I think that it threw off his rhythm in the kitchen. We were interrupted on a handful of occasions by him standing in silence at the end of the table. He would say “I can wait” and the group would get themselves to calm down so he could explain the dish. After the dinner we all stood around chatting some more and we were asked if we noticed the phenomenon – so it wasn’t just us. The Price: $70 USD per person. $140 USD for two. 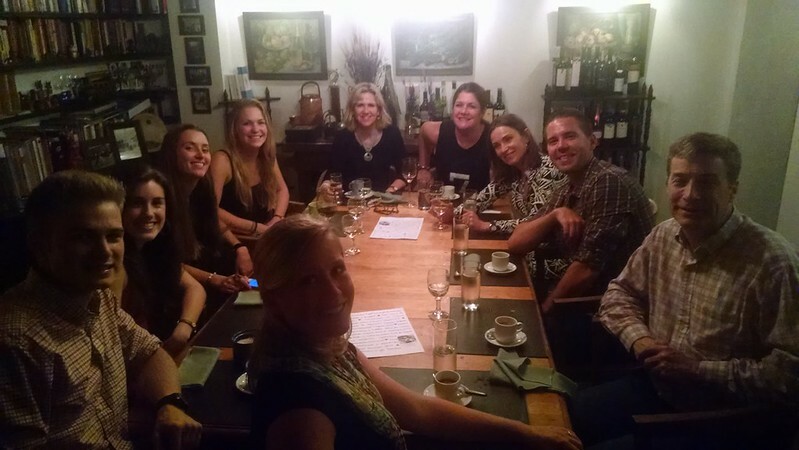 A few nights later we had an 8:30pm at Casa Coupage, a former wine club turned close-door restaurant operated out of a house in the Palermo neighborhood run by two sommeliers. I should note that 8:30pm was their first reservation. Many restaurants do not open their doors until 8pm and the main dinner crowd doesn’t arrive until 10pm. The locals eat late here. I don’t know how they go to work the next day. Classical outside the location pic. This one is in front of Casa Coupage. Similar to Casa Saltshaker the house was unmarked, you rang the intercom, let them know your name and were then greeted by their host. This place was run much more like a traditional restaurant with tables based on your group size. We had two in our group and thus we were asked to select a table for two. The place was gorgeous and the tables were set very elegantly. The very elegant dining room at Casa Coupage. Most evenings Casa Coupage offers a few different dining options. You could order both wines and food a la carte, order their tasting menu and they would also have a few different wine pairing options (3, 5 and 7 wines). Because we happened to be there during their anniversary celebration we only had two options for food. 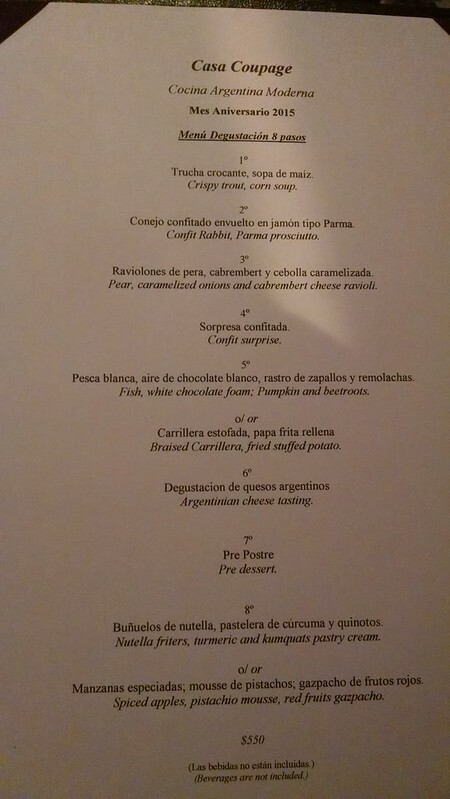 There was a seven course “our favorite dishes from the years” menu and and special eight course menu. When we were told of the different menus I thought that for sure we would go with their special seven course anniversary menu but after taking a look we opted for the eight course. And..I don’t think that I need to write this – but we did go with the seven wine pairings. The eight course menu we selected. The Good: This place was a lot of fun to eat and drink wine. The sommeliers really enjoyed having you try different wines with different foods. There were never less than two different pours in front of you and that was on purpose so that you could taste the changes in the wine and the food. And these pours were VERY generous, and would keep coming. They also had a “confit surprise” on the menu. They didn’t tell you what the meat was, but asked you to be a good sport and give it a try. We were just about finished with the plate when the chef came over and explained that was we had eaten was beef tongue. Cool. The OK: I liked the communal dining better, but there was nothing not good about this place. It was my favorite. The Price: $45 USD for eight course food, $30 USD for seven wine pairings, three waters and two coffees $15 USD. Total $165 USD for two. And then towards the end of the meal. And it was a looooong meal (arrived at 8:30pm, left at 1am) and there was a lot of wine we began talking with the entire dining room. Three other couples. One from the U.S., one from London and one from Australia. We were getting along swimmingly with the couple from London and decided to go out together. A couple of bars, some more drinks, a few 1L beers and a live band later we stumbled home at 5am. We were supposed to have Spanish lessons with our tutor at 9am, so that wasn’t going to work out. I sent him an incoherent email when we got back to let him know that we weren’t going to make it. He got the message, not sure he completely understood it, but was able to tell that we weren’t in good shape – mission accomplished! 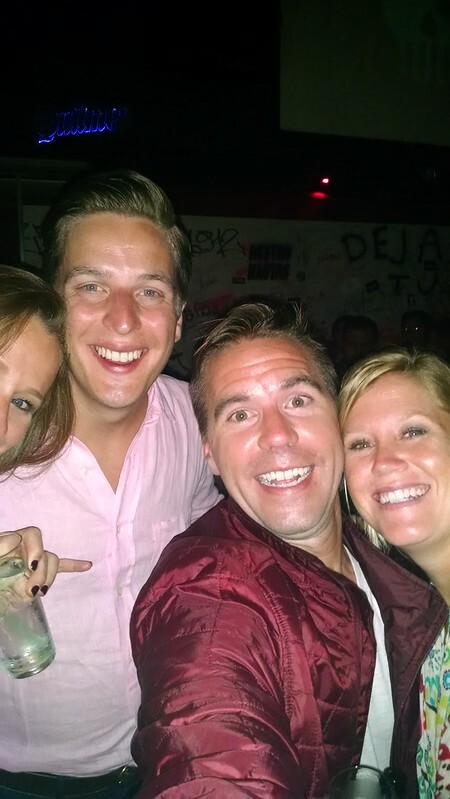 Our new friends – taken a local heavy metal live music bar at 4am. 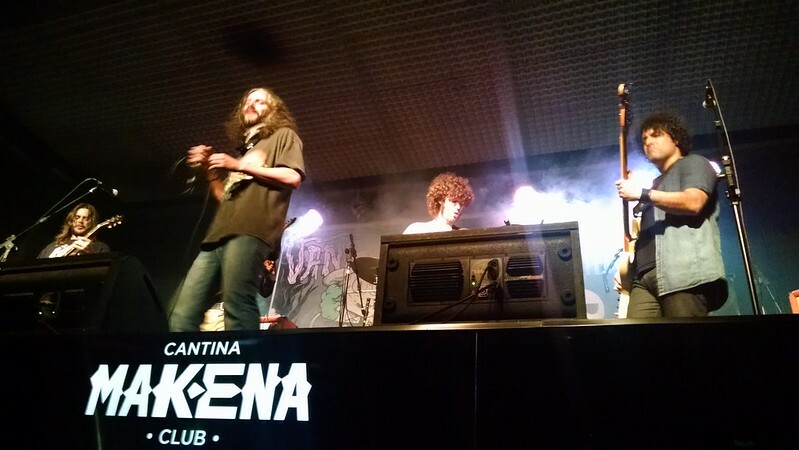 The club is called Cantina Makena, I have no clue what the band was called. But they were playing on a stage on the second floor. We were by far the oldest in this place. Our third and final stop was Cocina Sunae. I was most looking forward to this place when we made our reservations. 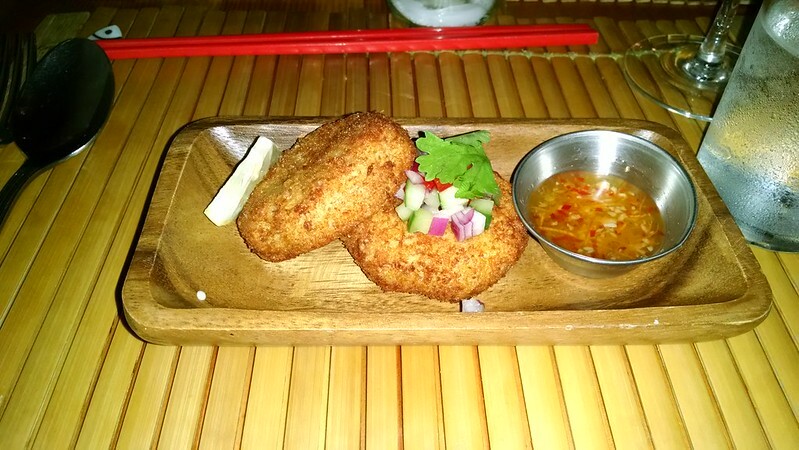 They serve authentic Southeast Asian cuisine and the reviews were outstanding. F yeah. 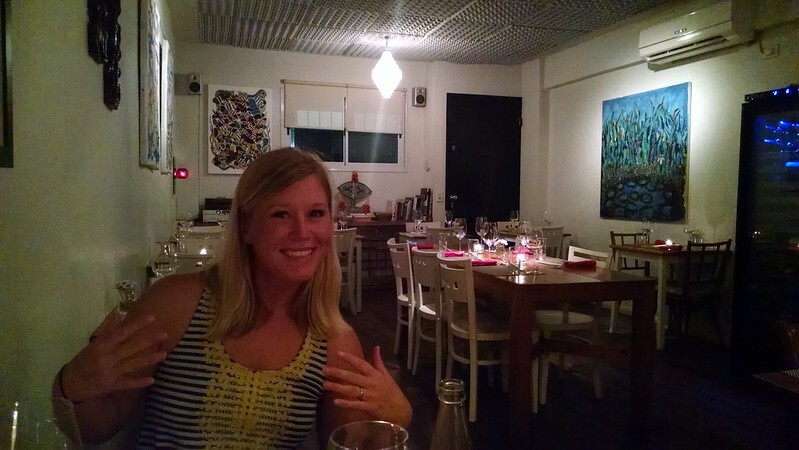 We made our typical gringo 8:30pm reservation and were the first people in the restaurant. It was raining out that night and they had an enclosed porch setup for dining so we pointed to a table out there. The server kindly let us know that we could get leaked on due to the faulty roof. No problem, how about that table over there and we pointed to another table on the porch closer to the building. He said that table was in fact reserved for people that “knew about the leak.” Hahaha…what? Ok, we will sit inside. LIndsay at the table. We were really excited for dinner! The odd and somewhat funny exchange in the beginning was really how the rest of the night went. I wasn’t overly impressed with this place. The service was ehh, the food was OK and there wasn’t anything that would bring me back. The Good: They serve a four course dinner so you’re not there for more than two hours. I’m not sure we could have lasted any more courses at this place. A couple of their dishes were really tasty. Our first course, fish cakes served with their homemade siracha sauce were fantastic and I had a homemade coconut curry main dish that was easily the most flavorful dish I have had in South America. The OK: The service was very OK. No one came over to explain what we were eating, make any recommendations on wine or main plates and the food came out lighting fast. The servers were picking up empty plates that we had just finished with one hand and putting down a new plate with food with the other and immediately walking away. This place, in a complete contrast of the others, seemed like they were trying to turn tables. Price: $29 USD per four course, $5 USD per cocktail & $15 USD for a bottle of Pinot Noir (about the average price) Total: $85 USD for two. When the dust settled we had a blast with these closed door restaurants. They really are doing a good job serving food out of regular home kitchens. The people we met were the highlight from all of the places but the food and wine was outstanding as well. As with all restaurants some were awesome and some I wouldn’t go back to or recommend.